Raise your hand if you rang in the new year with the flu. OK, put it down because that probably hurt if you’re sick. It seriously feels like everyone has the flu. We had it on a 38-hour journey back from Africa, and if you’ve ever wondered what hell is actually like, fly with the flu while watching the sky map on the monitor move less than one pixel per minute. And then have your daughter puke in the car ride on the way home. Happy new year! Ok, I can’t really complain though because we were on safari in Africa, and — lion cubs. More on my Instagram account. I’m only starting to feel half human at this point, so I’m going to keep this short, and write it on a blog so that I don’t have to use my actual mouth. Everyone knows that there’s nothing better (except maybe Tamiflu) to have on hand than chicken soup when you’re feeling like crap. But not everyone has a mom in the house that can make it for them. All the prep for this can be done while sitting; you throw it in the pot, and walk away. I use an Instant Pot pressure cooker (because I use it for everything nowadays), but you can also just put it on the stovetop on simmer for an hour and a half or so, til the chicken’s tender. Either way! Put in pot. Set to manual pressure 30 minutes. Go lie down or moan in misery. When cycle is complete, release pressure. Take out chicken and put on plate; with two forks, pull the meat off the bone and put back into the pot. Eat alone or add in cooked rice or noodles for extra bulk. Every once in a while, things I grew up with in my Chinese-American household manage to become the latest craze. Supplementary math books, growth mindset, and now: bone broth. I’ve read tales of people queuing for these magical cups of inflammation-reducing, hair-skin-and-nail-enhancing elixir. While those appear to be attractive benefits of drinking broth, there’s another good reason to give it a try: it tastes really good. And after I have broth, I feel really good. I’ve been drinking a lot of broth lately because I have a bum knee. For years, running has been my outlet for stress and my ticket to a decent night’s sleep, but years of aggressively pounding on concrete is finally catching up with me. I’ve had pain off and on for a couple of years now, but I really can’t run without pain anymore, and now it’s starting to hurt sometimes when I walk (never mind the gross popping sound it’s making now too). I’m seeing a doctor tomorrow, but for now, broth tides me over. Sipping broth is a spiritual experience. It feels to me like serenity and replenishment. In our crazy lives there are so few things in life that we can control, so when there are opportunities to create serenity — in my case, like buying a really quiet dishwasher and oven. Broth is way cheaper than either of those! My daughter made an Asian-style broth in a slow cooker; check out the video below to find out how! Heat the vegetable oil in a saute pan and sear the onion and garlic til browned. Keep them in big chunks as cut so they’re easier to fish out after cooking. Add to slow cooker. Add in bones, ginger and mushrooms, and fill the slow cooker pot with water until just 1 inch below the upper rim. Cook for 1 hour on high and then 15-23 hours on low. Occasionally skim fat and other matter that floats to the top off the surface of the broth (I find that when I use bones from previous roasts, there’s very little cloudiness to the broth and you don’t have to worry about skimming much. I also prefer the flavor from pre-roasted bones). Take out the solids (or pour the liquid through a strainer into a large bowl), season with salt as desired, and enjoy! If you want to keep an ongoing broth factory, just keep adding water, bones and veggies (feel free to experiment!) to leftover broth and cook — the flavor will become more complex over time. I am mobile blogging to you today from beautiful Torrey Pines State Reserve! I decided to rely on my middle-aged brain instead of checking my calendar, so have arrived an hour early to meet a friend and still have time to kill after forcing myself to do a run. So mobile blogging! Ok, timely info: it’s almost Mother’s Day, and I don’t know about you, but my mom is a big fan of saving money. Rejoice: my friends over at OpenTable let me know that you can enter to win one of 10 $150 restaurant gift cards! I entered of course, and I think you should too. Here’s the link; if you win, I also think that you should invite me, even if it’s not technically in OpenTable’s contest rules. Now, next in the series on foods that are as much fun to say as they are to eat: tabbouleh! I love tabbouleh, and so does my younger kid — we just love the awesome texture of the bulghur wheat couples with the tangy goodness of lemon juice and the party that mint and scallions bring to the table. Tabbouleh is also super easy to make. Here, my apprentice shows you how. It’s a fantastic make-ahead option too — tastes even better if you give the flavors time to develop. To prepare bulgur: Place bulgur in bowl. Alice says to add cold water to cover by 1 inch, but I add boiling water — I like the tabbouleh a little softer. Soak for 20 minutes or until grains are plump. Drain in sieve. To mix salad: Meanwhile, in large bowl, combine parsley, mint, scallions and tomatoes. Using hands, squeeze soaked bulgur to remove as much water as possible. Mix bulgur into chopped herbs and tomatoes. Add lemon juice, salt and olive oil. Mix well. Taste and add more salt, lemon juice or oil if needed. Let rest for 1 hour before serving to allow bulgur to absorb flavors. They are the symbol of freedom. Nothing beats an elastic waistband when you’re eating. NOTHING. This is the year of the cute sweatpant (or, jogger, as it’s been rebranded). There are the printed type, which I like in concept but which always look like pajamas on me (probably because I refuse to wear heels with them, which I feel defeat the purpose of achieving ultimate comfort), and the solid type; these from Athleta are my all-time favorites (I got them for Christmas — thanks San-do-ra!). I left my executive job and am now consulting, mostly from home. I was just finding that even when I was at home, I was never mentally available to my family…I have a real problem compartmentalizing work (plus there were the weird hours and challenges of working in an international business). It’s been a lot easier now that I’m in full control of my work and time…and plus I can wear sweatpants. There are, of course downsides to the exclusive wearing of elastic waistbands. The other night I went out to dinner for a friend’s birthday, and, as it was at a restaurant, I thought the occasion warranted pants (and not the elastic waistband kind that is made to mimic pants, which I have — but the real kind with a zipper and button and everything). Turns out if you move into real pants after weeks of wearing joggers, you have to go to the bathroom every 20 minutes from the extra pressure. Also, you may find yourself thinking things like, “Why should I have a separate wardrobe for sleeping?” Still, a small price to pay for the otherwise boundless joy. While I was sitting around in my sweatpants over the holidays, we had visitors. My brother and his family came to visit. 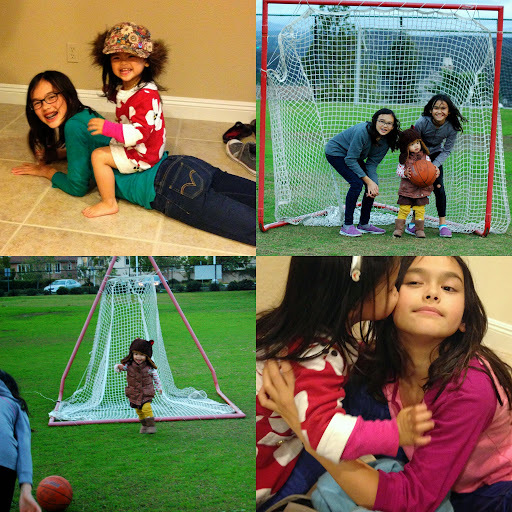 The girls had so much fun with their little cousin, who is a big fan of hats. And, they were nice and moist. 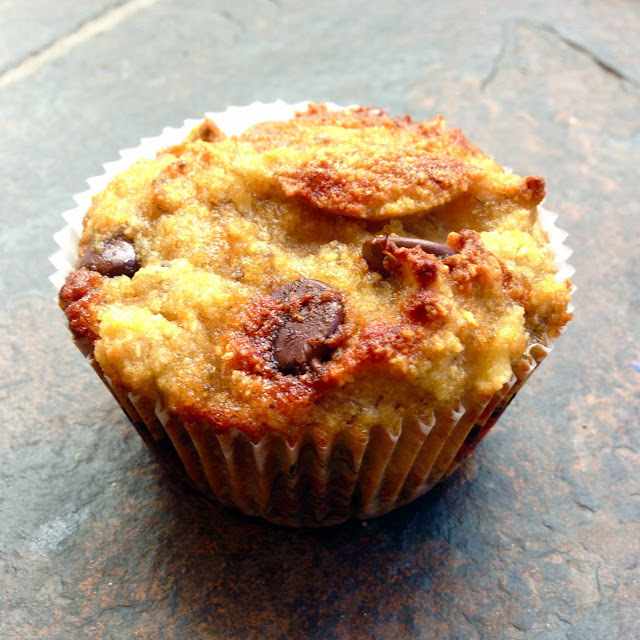 I’ve tried this recipe with a number of variations, and you can pretty much add in any combination of flavors and arrive at a nice paleo muffin. My favorite part about the recipe — it’s a one-bowl wonder. Just throw everything into a bowl, mix it up, pour into muffin tins and bake! Leave me a comment if you try a different variation — I’d love to know about any winners! In a large mixing bowl, combine the coconut flour, eggs, orange juice, zest, maple syrup, coconut oil, vanilla, baking soda, chia seeds and salt. Use a whisk to mix well, breaking up any clumps, then fold in the fresh cranberries and the shredded coconut. Since these muffins are very moist, leftovers should be stored in the fridge for best shelf life, but bring them to room temperature again before serving for best flavor and texture. It’s finally the end of the week and I’m feeling like the fish above. He’s all, “Girl, my terrariums are all dessicated and don’t even talk to me about my hair, so I’m just going to lie down in a bed of butter and lemons now.” Am I projecting? I got back from another business trip to London a couple of weeks ago. Every morning I ran in the mist like a gorilla, which is my favorite weather and method to run in. It wasn’t like I was very noticeable wearing hot pink running shoes, a purple running skirt and a fuschia jacket or anything. I always said that exercise was dangerous. Later, I did manage to make it to a pop-up restaurant in SoHo called The Full English, and felt much better after stuffing myself with bacon, eggs, tomatoes and beans. Check it out if you’re in London. So that was London. Now on to fish. Trout is one of my favorite fish, and what I love about fish (aside from the brain health benefits that I so desperately need) is the speed with which you can prepare it. I’m not terribly experienced with cooking whole fish, so I used this Whole Trout en Papilotte recipe from the Food Network. Place some chopped onion on a piece of parchment paper, lay the fish on top and cut slits into it. Season it inside and out with salt and pepper. Stuff the fish with herbs, coat the top with shallot butter (see instructions below) and cover it with a layer of lemons. I wrapped it in the parchment, grilled it for 20 minutes, and it was done! Moist, tender, and makes you smarter! Preheat oven to 400 degrees (I used a grill — either will work!). Cut 2 sheets of parchment paper large enough to completely cover the fish when folded. Wash and dry the trout. Using a knife, score the fish on 1 side by cutting slits into the flesh just until you feel the bone. Season the trout generously, inside and out with salt and pepper. Spread 1/4 cup of the onions on each sheet of parchment. Place fish on top, scored side up. Stuff the inside of the fish with herbs. (It’s ok if they stick out a bit). Top each fish with 1 1/2 tablespoons of the shallot butter. Cover with the lemon slices. Drizzle 1 tablespoon white wine and 1/2 tablespoon olive oil over each fish. Fold the parchment over the fish. Starting at 1 end, fold the paper on itself, making sure to completely seal it. At the end, fold it underneath itself. Repeat. Place fish on large baking sheet and cook for about 12 to 15 minutes. To serve, place trout en papillote on a platter. Cut the parchment at the table to ensure that all the aromas stay inside the package. In a food processor, combine all ingredients until mixed. Place whipped butter mixture onto a sheet of plastic wrap and roll into a log. Freeze until ready to use. Butter will keep in the freezer for at least a month. You know, because I have so many tea parties. But then I realized that this decision was headed for the same outcome as a purchase I made 10 years ago of pleather pants, so I made a quick jaunt over to Carnaby Street where I bought overpriced scented erasers as souvenirs for the kids. It was a hectic but productive trip, and as soon as I got home I promptly fell ill. And then got on a plane again soon thereafter. All this rushing around argues for a bit of simplicity. One of my favorite things about summer is tomatoes. Heirloom tomatoes, to be exact. Colorful, flavorful, deliciously simple. We still have time for that. I made this salad as part of an dinner we had with friends outdoors on a warm summer night. Because when you are a friend just arriving from Germany, with another on her way to Europe and a third who is Canadian, it would only be logical to stop in for a meal prepared by a Chinese American married to a Brit. It’s a simple one really — just some slicing and a vinaigrette. But perfectly colorful, tasty, and quick enough to allow you time to enjoy some pause amidst the busyness of everyday life. Slice the tomatoes into slices 1/4 inch thick. Place them in a single layer on a serving dish, and sprinkle with a pinch of salt. Mix the balsamic vinegar and salt together, until the salt dissolves. Add in olive oil and stir until combined. Grind in some fresh black pepper to taste. Pour over the tomatoes. Julienne 3-4 leaves of basil and sprinkle over the salad. It’s Saturday! My favorite day of the week. What I like to do on Saturdays is to stay in my pajamas as long as possible, not brush my hair, and basically aspire to be the definition of “unkempt” in the dictionary (remember those?). I have relatives in Asia who post occasionally in Chinese. When I hit “Translate” on a post this week, this is what I got: “Baby Flash today to the waist, my home is caring said Filipino: his wife, I help you with your horse at night to kill the chickens! I think that is OK under the NIE just two, so was delighted to accept. Didn’t think she really be practiced! In my bed at night to enjoy professional massage essential oil. Joy you are my angel! muaaah!” Can this be right? Is my cousin okay, and where is this professional massage essential oil coming from? How did they know how to translate muaaaaah? My sweet friend Danielle at Cozycakes Cottage posted about me to her zillions of followers not once but twice! Very kind of her. 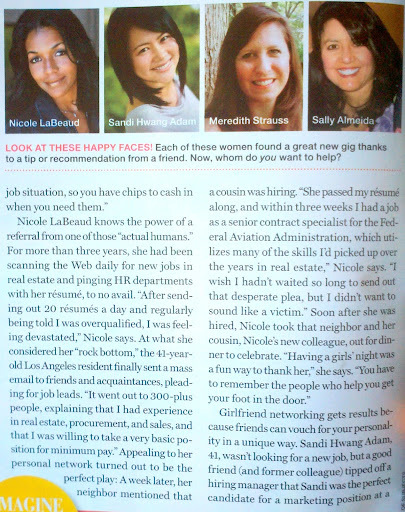 A high school friend posted on my wall that she just read about me in this month’s issue of Redbook. I was hoping it was a surprise article wherein they unveiled a special subsidy for me to focus on nothing but eating delicious foods for the rest of my life, but when I went out a lunch to get a copy, it was just an article about jobs. I’m the second from the left. I guess my part of the planet is about 45 degrees offset from everyone else. Anyway, on to the food. As some of you know, I generally try to make tasty foods that are also reasonably healthy — though I won’t compromise on flavor. One of my favorite magazines (uh, aside from Redbook of course) is Whole Living, which is filled with beautiful photography and prose that reduces your cortisol levels upon reading. I like to read about food before I go to bed, so it’s a standby on my nightstand. I also really love beets. Check out my header. So when I saw this Beet Hash with Eggs, I knew that it was a message from God. I shalt make thine Beet Hash, and I shalt make it on the day before the Sabbath. Boil peeled and diced beets and potatoes for 7 minutes, and then fry them up in a pan with some onions. Make four little wells in the hash, and fry up some eggs. That’s it! Well, mostly, read the recipe for details.